There were 686 press releases posted in the last 24 hours and 153,492 in the last 365 days. 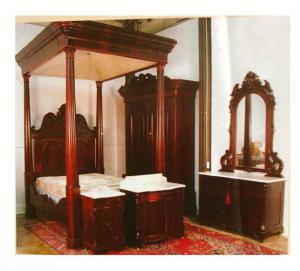 Five-piece Prudence Mallard bedroom suite, hand-made around 1850, one of several outstanding beds in the auction. 1933 V-8 Cadillac, gray in color and looking virtually brand new, having been restored ten years ago. 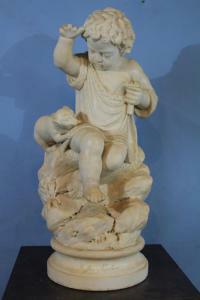 Two-part marble statue of a little girl with a cat, 31 inches tall, signed "Napoleone Ruffini". 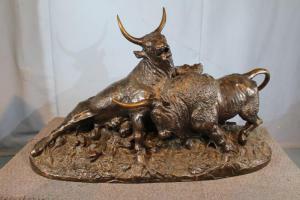 Bronze sculpture of two Spanish bulls fighting, signed by Jean Baptiste Clesinger (1814-1883). Magnificent three-piece marble clock set with bronze accents. A gorgeous Prudence Mallard five-piece bedroom suite, a Sevres three-sided capped urn and a bronze sculpture of fighting bulls are just a few expected top lots. ABERDEEN, MISS., UNITED STATES, May 11, 2018 /EINPresswire.com/ -- ABERDEEN, Miss. – A gorgeous Prudence Mallard five-piece bedroom suite, a Sevres three-sided capped urn, a bronze sculpture of fighting bulls signed by the French artist Jean Baptiste Clesinger (1814-1883), a fully restored 1933 V-8 Cadillac in showroom condition, and a two-piece marble statue of a little girl and cat signed “Napoleone Ruffini” will all come up for bid. They’re just a few of the expected top lots in a massive, two-day antique estate auction slated for Friday and Saturday, May 18th (at 5 pm Central) and 19th (10 am), by Stevens Auction Company, in the firm’s gallery at 609 North Meridian Street in Aberdeen, located south of Tupelo and north of Columbus, not far off of State Route 278, near the Alabama state line, in eastern Mississippi. For those unable to attend in person, online bidding will be provided by LiveAuctioneers.com. The antique furniture category will be just as impressive, with examples by John Henry Belter, J. & J.W. Meeks, Anthony Quervelle, Mitchell & Rammelsberg and other artisans of 19th century American craftsmanship. Also sold will be fabulous clocks, china, sterling silver, brilliant cut glass and hundreds of other pieces of Southern finery, pulled from fine estates across the South. The five-piece Prudence Mallard bedroom suite, hand-made around 1850, is just one of several outstanding beds in the auction. Also sold will be an unusual, one-of-a-kind walnut Victorian full tester bed, with carved swans, dolphins, faces and inlay all around, circa 1860; and a rosewood rococo three-quarter tester plantation bed with matching dresser and half commode, circa 1860. The signed Sevres three-sided capped urn was described by Mr. Stevens as “one of the most magnificent and rare palatial Sevres urns ever to be offered at auction.” Other beautiful lots include a Victorian brass and silver chandelier with full bodied figures, circa 1910, in gorgeous condition; and a Victorian gold gilded over-the-mantel mirror, 72 inches wide by 82 inches tall. Stevens predicted that the two-part marble statue of a little girl with her cat, 31 inches tall and signed “Napoleone Ruffini”, could very well end up being the sale’s top lot, “it’s that beautiful.” The bronze sculpture of two fighting bulls, signed by Jean Baptiste Clesinger, could also be a contender, as might a marble bust of King Leopold, signed “E. Conslon Ford” and dated 1901. 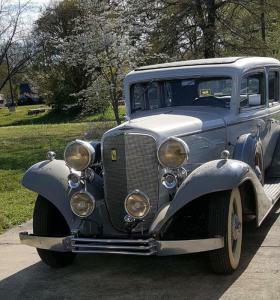 The 1933 V-8 Cadillac, gray in color and looking virtually brand new, was restored ten years ago and has been kept snug in a heated garage ever since. Bidders with an eye for lovely things will be attracted to the three-piece marble clock set with bronze accents; and the large, hand-painted Dresden capped urn with applied flowers and a depiction of Greek girls. It stands 29 inches tall. Another visually striking lot is the cast bronze garden fountain with lion heads and children, signed “Jim Davidson”, impressive at 10 feet 7 inches tall. The fine art category is impressive as well and features two antique oil on canvas portraits, of a distinguished lady and gentleman, both housed in beautiful Victorian gold frames measuring 31 inches by 27 inches, the artist unknown. The furniture category will feature a burl walnut three-hinge Wooten desk in fine condition, with a full fitted interior, circa 1890; a mahogany Empire pier table with marble column front and gilded feet, circa 1840; a rare Renaissance Revival walnut desk chair with Jenny Lind head and gilt incising, and nice tufted leather upholstery; a Louis XV French dining table, 66 inches long; and a set of 16 burl walnut Irish Chippendale dining chairs (two armchairs and 14 side chairs). Returning to artwork, up for bid will be an 18th century oil on canvas rendering of a Dutch pub scene, showing patrons playing a game, with an overall size of 32 inches by 27 inches; and two portrait paintings, of Queen Victoria and Prince Albert of England, both signed “I. Bailey”. Also sold will be a fine 19th century Erard gilt wood and maple harp, all ready to be sat at and played. An open house will be held in the Stevens gallery on Friday, May 18th, from 10 am until the start of auction at 5 pm (Central). Doors will re-open again on Saturday, May 19th, at 8 am, at which time attendees may preview the merchandise until the first gavel falls at 10 am. More than 1,000 photos of the lots can be viewed now on the Stevens Auction website: www.stevensauction.com. Terms of payment are all major credit cards or pre-approved business or personal checks (with proper ID), or wire transfer. A 15 percent buyer’s premium will be applied to all purchases, with an extra 2 percent processing fee for credit cards. A sales tax will be charged as well, except for those with a valid, verifiable state resale number. Refreshments will be served both auction days. Stevens Auction Company is always accepting quality consignments for future sales. To consign a single item, an estate or a collection, you may call them directly, at (662) 369-2200; or, you can e-mail them at stevensauction@bellsouth.net. 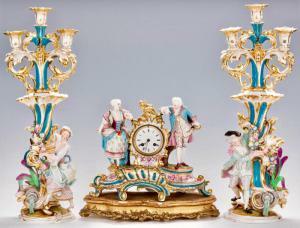 To learn more about Stevens Auction Company and the May 18th-19th antique estate auction, visit www.stevensauction.com. Updates are posted often.